Garcia del Soto, Helen Hamlyn Senior Fellow at IIHA, discussed the exhumation of one mass grave in the mountain village of Rabinal, central Guatemala. She said that the effort involving both psychologists and anthropologists demonstrated the need “to move in an interdisciplinary way” in this sort of research. 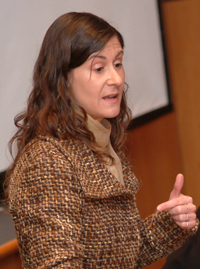 She described the Rabinal project as “a unique opportunity” to examine the individual and collective effect of exhumations on this mainly indigenous Mayan community. “It was a very good opportunity for locals to share their memories and retell their story,” said Garcia del Soto. “This process is also about trying to recover or exhume the truth of what happened,” said Beristain, who has worked in Central America for more than 15 years. The mourning process and a quest for truth and justice happen simultaneously, he said. IIHA was established in 2001 to forge partnerships with relief organizations, publish books, create training programs and host symposia relating to humanitarian affairs. It also offers an academic base for the study and development of international health, human rights and other humanitarian issues, especially those that occur in periods of conflict. Garcia del Soto will present a talk on war crimes in the Balkans as part of the Brown Bag Lecture Series on April 12.